So, let’s say you’re doing a little shopping, performing some online research, or otherwise digging around the web, and you want to save all the tabs you have open. 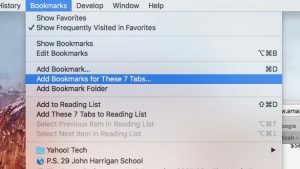 Instead of creating bookmarks for your open tabs one-by-one, try a two-click Safari feature that’ll take all your Safari tabs and instantly save them into a new bookmark folder. You can create a bookmark folder for all your open Safari tabs in just a couple of clicks. Click the Bookmarks menu at the top of the screen (if you don’t see it, make sure Safari is the active application on your desktop), then select the “Add Bookmarks for These (x) Tabs” option. When you do, Safari will start the process of creating a new bookmark folder complete with bookmarks for all the open tabs in your current Safari window. Just create a name for the folder (“Saved Tabs” is the default), pick a location in the Bookmarks menu (such as “Favorites”), then click Add. Now, just click your new bookmark folder, and all the tabs you saved will spring into your active Safari window. You can set your new bookmark folder to open your saved tabs without closing any existing ones. 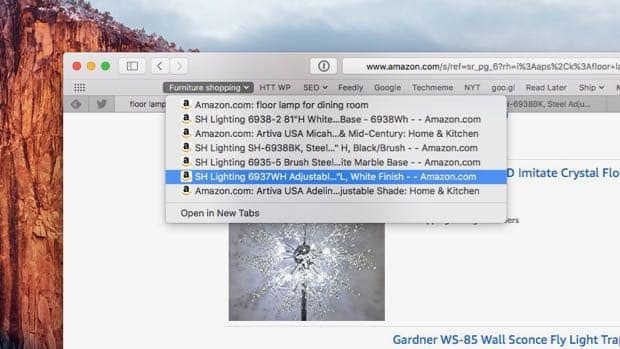 If you put your bookmark folder of saved tabs in your Favorites bar, clicking the folder will instantly replace all the open tabs in your current Safari browser with your saved tabs. 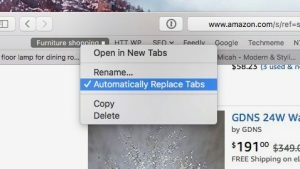 To open your saved tabs without closing other open tabs in your Safari window, right-click the bookmarks folder of saved tabs in the Favorites bar, then uncheck the “Automatically Replace Tabs” option.